Hello all. I left all my old pics on so you could see the progression. Great contest, I tip my hat to the double D's. hey im a newb! signed up for this awsome contest so looks like you guys are stuck with me..........also looks like this is the place to show my entry.....i feel it is done but am having a lot of fun tinkering away at it......it is my first steampunk attempt so dont laff too hard. also i am very unhappy about these pics so expect some better ones. That's really phenomenal. I seriously love this. Rocko might have some competition. My only recommendation: Fix your keyboard's shift key. That brought a smile to my face! Nice work. I just pooped my pants. That is amazing! I love it so much. All the detail is so awesome! How long did it take you to build that? I know you just joined here. You are an awesome builder, I Love your work! That is one of the better MOCs I have seen so far, I look forward to more pics! Of course, since your competing with me, I'm just going to insult you. No, but it really is amazing. The only thing I would do is take off the hanging skeletons and skulls. They make it seen more of a post-apocalyptic MOC. Also, I would add bigger guns. so what kind of guns are going to work? not lasers right? Steam-propelled bullets? Or gunpowder-powered bullets. Well first I will have to offer apologies for my bad grammer. I just got the nod from the mod so I will do my best to type better. It is challenging as I do type with my Elbows. Just joking. so I imagine cannons will work just fine? Ok Thanks Xeta, I will go and tear off the silly catapult and get some gatling guns and cannons. Here is a side pic for you since you were so nice to me. 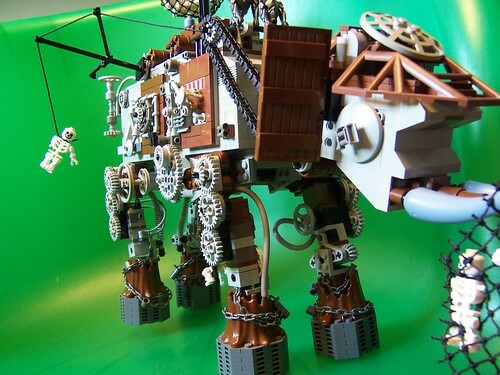 Awesome elephant, I mean AT-AT! Seriously though, great work. It looks really good. I like how it's got an elephant-ish style. Is there a hidden boiler that powers this thing? That's one thing I'd like to see is more steam workings. It's looking very creative though. Real imagenation! This is one monstrous work of art, if you have time sort out the figures, unless the seperatist droids and clones are working together. Or maybe it could be controlled by ewoks, and give the skellies stormtrooper helmets! Wow, nice. Does it have an interior? 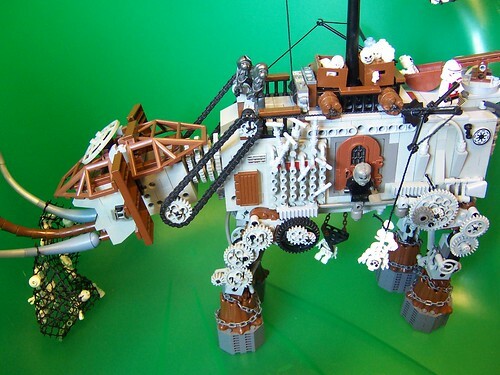 It kinda looks a little more like an elephant than an At-At but that should win the steampunk contest! Wow! This is really good. From that side view you showed us, around the door you might want to add a few things (you are probably thinking, Boy they are never satisfied are they ) Otherwise this is amazing! Yes the crowd does seem a bit picky. That is good because now I am inspired. I have the whole top torn off, and interior with boiler finished just need to recreate the deck. Then we are off to the gatling gun section. After that I will search the mini-fig drawer for some better characters. Finally, a preliminary picture with steampunked characters. I love the stokers! Great idea. I love how you made a furnace to power this monster. I think it's a great MOC and a real good challenge for this competition. Loving Lord Vader too, the hook is a good idea, but surely he should have one on the other hand too, and a pair of peglegs? This gets my vote for the contest. Rebelrock: Who cares about your TIE anymore! I love the furnace in the back of this thing. The stormies look awesome too! Whoa! Slow down guys, you have not even seen the boiler yet. Or the cannons and projectiles. Or the coal pile. But here is a final pic of Lord Vader for you since you give good kudos. He kind of reminds me of Honest Abe Lincoln. But eviler and uglier! Nice work, if this doesn't win then Don's been bribed. Here is the rest of the crew. And our Mechanic as well as ship Doctor, Grandpa Hawkins. That Vader has a great look for the steampunk theme. He might look cool with one of the gray peg legs too.